Product #16681 | SKU CT102464BF160B | 0.0 (no ratings yet) Thanks for your rating! 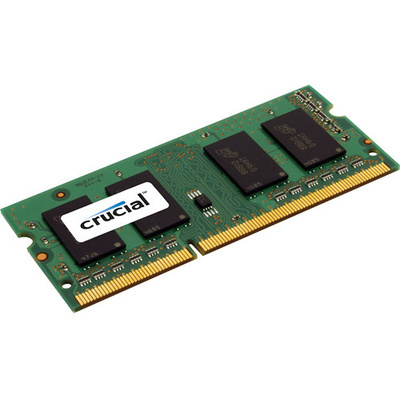 The 8GB DDR3L 1600 MHz SODIMM Memory Module from Crucial upgrades the memory in your notebook or compact desktop system. This unbuffered SODIMM provides 8GB of memory for a system that has an available 204-pin slot. For performance, it runs at a speed of 1600 MHz and has a CAS latency of 11. Furthermore, this DDR3L memory chip can operate at 1.35V or 1.5V.